Most police officers keep their shotguns/rifles mounted right beside them in their vehicles. While storing guns this way gives officers quick access, most of the time it just makes them uncomfortable because the guns are bulky and take up a lot of interior space. Another problem with storing weapons this way is that they’re in plain sight, which is attractive to thieves. In fact, there have been cases where cop cars have been broken into and guns stolen because they were in plain sight. But what can police officers do? They need their rifles and handguns in their vehicles to protect and serve, and so far, there aren’t any better options, at least not until now. StoreMoreStore offers a revolutionary new product specifically designed for police to store their handguns, shotguns, knives, ammo, and any other weapon safely and securely in their cars: vehicle trunk weapon lockers. These innovative vehicle trunk weapon lockers give officers the security of the trunk and the security of the weapons storage vault. The locker is mounted in the trunk of police vehicles with the visible part of the locker carpet covered black to blend in. It opens by electric impulse from either a hidden button or wireless remote key fob. There is also a master key provided with each locker to allow access in case of vehicle power failure. Also, the lock will withstand severe tampering because it is made of hardened steel. And you get all this without using any floor space in your trunk. 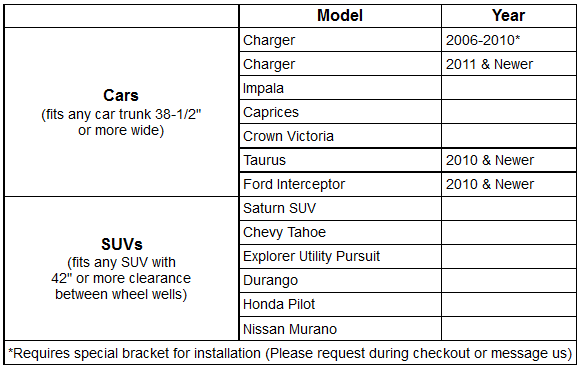 Below is a list of the cars and SUVs that can be fitted with a vehicle trunk weapon locker. 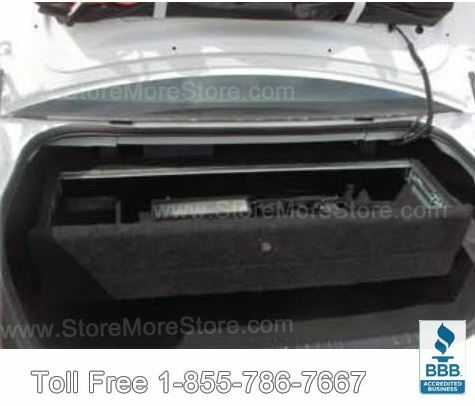 You can buy vehicle trunk weapon lockers online at StoreMoreStore. Our goal is to provide your law enforcement agency with quality products, so if you need any help or have any questions, give us a call at 1-855-786-7667.